Leigh's Fiber Journal: So. Whatever Happened to That RBS Anyway? ..... and then ran out of green yarn!!!!! That's right, I ran out of green yarn with only 20 stitches to go to finish the right front band. So. Everything has come to a halt while I am in the problem solving mode. One other thing bothers me too; the neck band. I don't like the look of the green going up the front and then just ending there like a tall green column leading to nowhere. So I am trying to rethink that as well. I think I would like it much better with the neckband in green, but alas....... I knitted in in white in the first place because I knew I'd be cutting it close with the green. On the other hand, I don't think I'd like the bands to be all in white, either. 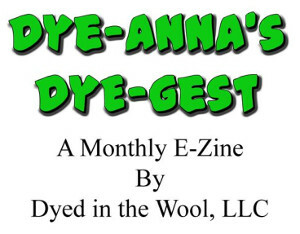 Of course, if I kept impeccable dyeing records, I could simply dye some more, as I do have more yarn in the breed of the body (Ryeland.) But I don't keep impeccable dyeing records. In fact, it's been so long ago since I dyed this yarn, that I don't really recall much except that it was Cushings. It occurred to me yesterday, that it might have been 'Ocean Green', as I kept that around for a long time. But then again, it might not have been. I don't have any Cushings 'Ocean Green' anyway. 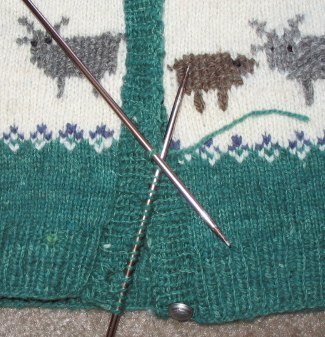 This cardigan has been in the works for a long time. I first got the idea back in August of 2002. The Online Guild was doing a Hebridean Rare Breed Fleece Challenge that month, and as I worked with my 150 grams of raw Hebridean fleece, I wondered what I could do with it. Being a project person, I wanted to be able to show it off in something. 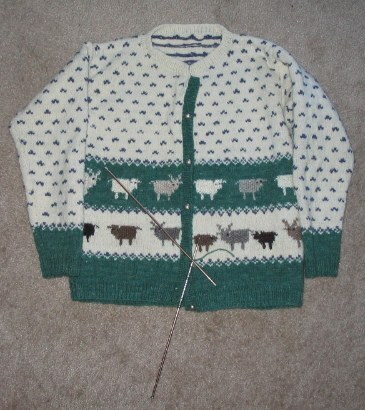 That's when I got the idea for this sweater, with each little sheep being a different rare breed. The yarn for the body of the sweater was spun in February 2003, when the OLG had a Ryeland Rare Breed Challenge. I was able to purchase an entire kilo for that one, and decided that this would be the bulk of the sweater. For the sheep, I've been collecting and spinning rare breed samples since then. Oh Leigh - I feel for you! I can't think of anything to recommend - unless you have swatched with the green and can unpick that. So close! So wonderfully very near, and yet so far! Bear in mind I have not knitted for many many years but just looking at the pattern could you do the edge in white where it is white and in green where it is green? I do love it though! Looks comfy and warm. I think it would look prettier with the button band in white that and it would be a lot less of a problem. It is beautiful! Hmm - you have me wondering when I'm going to get around to finishing my Norwegian Heilo lime green cardigan. I ran out of yarn along the way but my DIL solved that problem. But when I finished all the knitting the neckline just wasn't right and something has to be done. But 5 years, no it hasn't been that long. Good luck. Can you rip out the last row and maybe do a picot edge or crochet an edge in one of the sheep colors or the main body cream color? Beautiful sweater. I agree, the bands would look great the same color, either cream or one of the sheep colors, barring no one comes up with ocean green. Love you work on twills by the way. Very nice sweater, I think you are right about the two colors, I like the green. I hope you can find a color match for it. Oh, no! That's all I could think of when I saw you ran out of yarn. I have nothing worthwhile to contribute, except, "Oh, no!" Oh how awful. Too bad you don't have a swatch in the green that you could unravel for more yarn. I'd try to dye more yarn and just play till you get it right. Then you could have the neck band match. I think it would look great with all the bands the same color and the green looks the best. Definitely worth putting more thinking time into this one. The sweater is lovely and needs to be just perfect. Amazing knitting!!! Wait...I'm supposed to be keeping dyeing records??? Dang! No matter what you decide to do with the neck band the sweater is beautiful!!!!!! After five years you've done alot to be proud of. It is an absolutely gorgeous sweater, and you're right - the white neckband just doesn't seem right. It will be interesting to see how you solve this, as knitters are nothing if not innovative and resourceful. But it's better when you get to decide to be, not that you are forced to be - ouch! Like Marcy - what came to mind was OH NO! I don't knit at all, and I know how much work you've put in to it, but I wouldn't even have a clue as to how to fix it - tho I do wonder what it would look like if you edged it in grey? T.
Unfortunately, I have been here more than once. Looking at the sweater, I think your best bet would be to cut off either the cuffs or the bottom ribbing a couple of row in. Sounds desperate right, but this is totally doable Leigh. Decide which area you can best sacrifice a bit of length. You will have to do both cuffs to keep them even or the bottom ribbing. I can't remember if you did this in the round or not. If you did I would go for the bottom ribbing. It is bigger but only one piece. Make one little snip then carefully unravel that row through your stitches. You will want to have a couple of sewing needles with contrast yarn handy to thread through those live stitches. Once you have the amount of yarn you need, finish off your button band and then regraft(yikes,I know but it is doable, I've been here)your bottom band together. As I was writing this it occurred to me that maybe a pretty bias band could help but I'm not sure how, I'm not really a sewer but have seen bands like that. My other thought would be to cast off both button band edges in one of your browns from the sheep. You could also add the brown as the cast off edge on the neck edge too. Harmonize all the bands. How about simply taking one row off of the button band and then binding off with that yarn. I don't think the one row less would show since it is on the underside. I also think the green might look better around the neck, but the white is lovely too. I think the light grey yarn you have used for some of the sheep motifs would be a suitable and understated contrast for the neck and button band of your beautiful cardigan. I think it would work. P.S. I love to visit your weblog and read what you're doing; keeps me engaged in my own craft endeavours.